Hiya blog friends! Happy Hump Day! Can you believe how fast this week has flown by? It is so beautiful today, sunny and mid 80's but yesterday was a very scary day with all the tornados. On one hand I feel happiness that my home was untouched but then again, I feel sadness for all the homes that were destroyed. So to take my mind off the scary storms, I decided to get creative and make another Easter card. 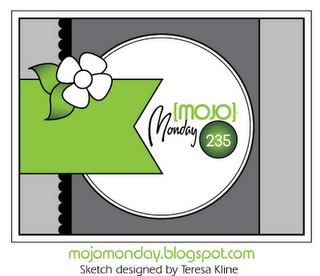 I used the Mojo Monday sketch #235 to build my card. I had so much fun making this card, here is my take on the sketch. My main focal stamp is a digital stamp by Pc Crafter. These little Easter pals are just so adorable! I put on a happy face while coloring these little guys in. I colored them in using my copic markers. I used Bazzill cardstock and the patterned papers are from the Sweet Summer collection by Colorbok. 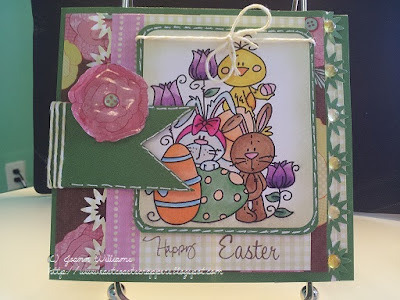 I made the sentiment by using two different stamps, the word "Happy" is from PTI's Handwritten Notes stamp set and the word "Easter" is from a dollar stamp at Michael's. I stamped the sentiment in Momento Rich Cocoa. I used the Martha Stewart Starburst border punch on the pretty yellow gingham paper and on the bottom of my card front. 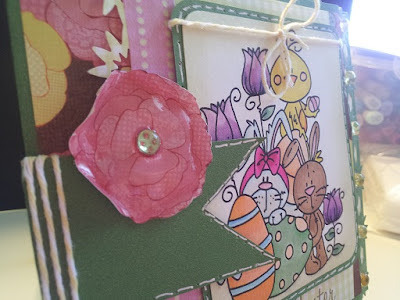 I used some dew drops on the bottom of my card front along the punched border and in the center of the flower, some Buttercream twine, and a pretty pink stitched strip of Washi Tape that I purchased at Cute Tape to add more embellishing. I used antinque linen distress ink around my stamped image and I used some glossy accents on my flower that I cut out of one of the patterned papers. To finish it off, I used some faux stitching by piercing holes with my paper piercer and making my stitches with a white sakura pen. My favorite tool used with this card for the Simon Says challenge is starburst border punch. Well that is my card for today, thank you for stopping by! This is so cute! You did a fabulous job coloring that Easter image! Thanks for joining us at Just a Scrappin. I love this card. It is so amazing what you did with it. Thanks for joining us at Just A Scrappin'. This card is adorable! Those little critters are too much fun. Awww, this is so cute! ACK! ADORABLE!!!! 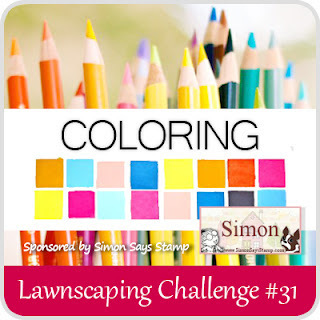 So glad you played along with us at Lawnscaping!!!! What a wonderful card. I love the various techniques and embellishments you used on this card. I really like when an artist challenges him/herself and in turn challenges others. Thank you for playing at Just-A -Scrappin'. Thank you ladies for all the wonderful comments!!! Oh this is fabulous, love all the details.